With a high-energy, rhythmic beat composed and produced by new label Real Know Real Productions, in association with the in-demand producer, Icon of Icon Music Works, "Mi Nuh Watch Party" represents just one of the musical styles of Kyodi, as well as his uncompromising sound. Born and raised in the St. Andrew garrison community of Big Yard in Kingston, Jamaica, Kyodi grew up with a passion for music, having been performing at several community and other events since the age of 9. These includes two appearances at "St Mary Mi Come From", the annual charity show staged by cultural artist Capleton, and most recently, the 5th Annual Allman Town Jamboree. This has resulted in Kyodi sharing the stage with several top local Dancehall and Reggae acts, including Capleton, Aidonia, Nesbeth, Queen Ifrica, Jahvinci, Bugle, Gage and Demarco. Some of his other activities in recent times includes recordings with The Guru of FOB Records, Dehva House Productions, and multi-talented personality, Supa Hype. The recordings are for his upcoming EP. "My aim is to make a serious impression on the local Dancehall scene before the end of the year, and, thereafter take it international," says Kyodi. "In my bid to achieve this, I intend to work as hard as I can, and, where possible, work with some of the best producers and artists in the business,” he added. The former national junior debate champion, who, before deciding on a career in music, played football for Kingston College and Excelsior High at the ISSA Manning Cup level as well as for Cavalier FC, lists Buju Banton, Sean Paul, Vybz Kartel, Mavado, Konshens, Aidonia, Popcaan and Busy Signal, as some of his musical influences. Kyodi also hopes in the future, having gotten a foothold in the industry, to do cross-over collaborations with top international acts like Rich Homie Quan, Nicki Minaj and Rihanna. 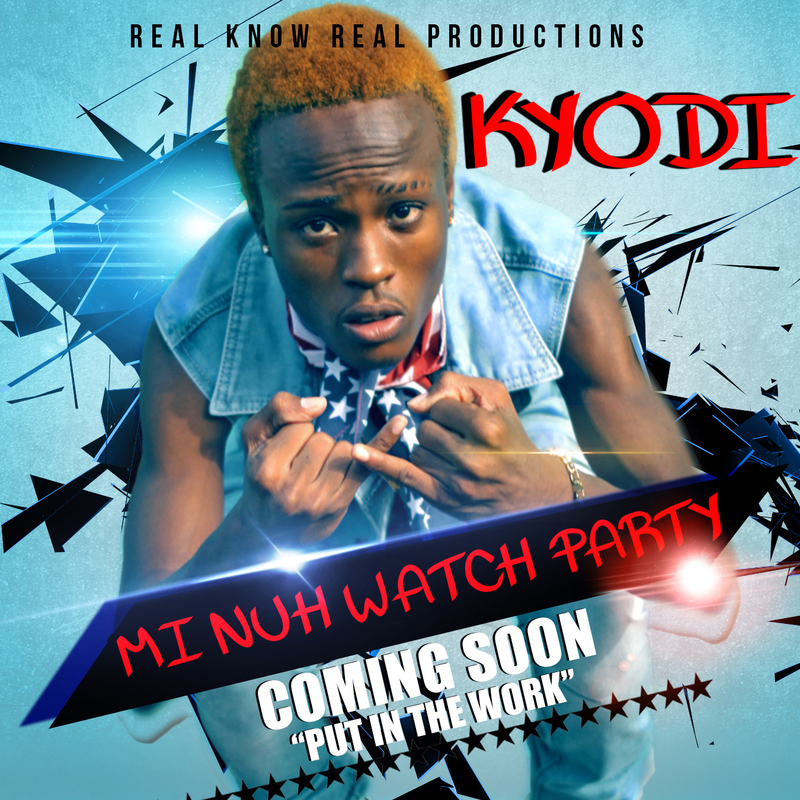 In the meantime, Kyodi, while focusing on promoting his debut single “Mi Nuh Watch Party”, is currently in the process of shooting a music video for the track as well. He also has a plethora of other tracks in the pipeline but his team at Real Know Real Productions has chosen his next single to be “Put In The Work”.